What is a vapor pen? If you have a friend or relative who smokes, it would be a good idea to gift him/her a vapor pen. Vapor pen are easy to use and maintain and a perfect device for beginners. There are different types of vapor pen, the cheap low range ones which cost under $15 have a bare naked coil which are messy to change and burn out soon causing bad vapor taste. The battery life is less compared to other mid-range and high range ones. What is a vapor pen? Coil head which can be screwed to a tank. The mid and high range vapor pen has a coil head which can be replaced easily by just screwing it in. They also produce large vapor. Most mid-range vapor pens are built in such a way where you can’t replace a crack glass, rebuild a coil or replace a battery as they are all put in a metal tube and sealed. What is a vapor pen if it’s not compact, light, easy to use and the ability to replace damaged parts. The V8 Stick Vapor pen from brand ‘Smok’ is one of the best device I have seen and used. Being small for beginners, it creates huge vapor clouds. 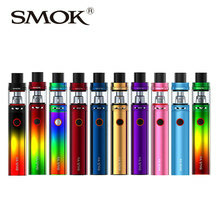 Features of Smok Stick V8, has a 3000mAh super high capacity and 20amps continuous discharge capability, while its tank is the famous TFV8 big baby tank which is 5ml and shares all the baby beast coils, when used with the included baby M2 coil head, which specially made for Smok Stick v8 battery, it will bring you a smooth and flavorful clouds, besides its swivel top cap design just brings you so much convenience when refills. 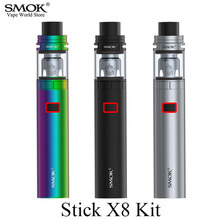 Smok Stick V8 come in black, silver and rainbow color. Besides the above features, they are few more other things to consider, adjustable airflow system, intelligent battery life indicator, multiple automatic battery protections, the coil head consist of V8 – Baby M2 0.3 ohms dual coils pre-installed and one more spare available in the kit. Smok V8 battery has a 510 connector which gives more variety of tanks to be used with this battery or the tank can be used on any other mods in the range of 25W to 45W, best being 35W with a 510 connector. As you can see the Smok V8 Stick is an improved version of its previous Stick’s models making the V8 the best buy vapor pen in the market. UPDATE: Please check Smok X8 which is a better upgrade of Smok V8, click here for more information. If you have any comments or questions please post them below. Thank you for reading my post, I hope that you understood what is a vapor pen. See you soon. What is in e juice? I found this article very interesting. Although I do not smoke or use an vapor pen, I did find the diagram and the mechanics of this tool fascinating. Thanks for sharing.